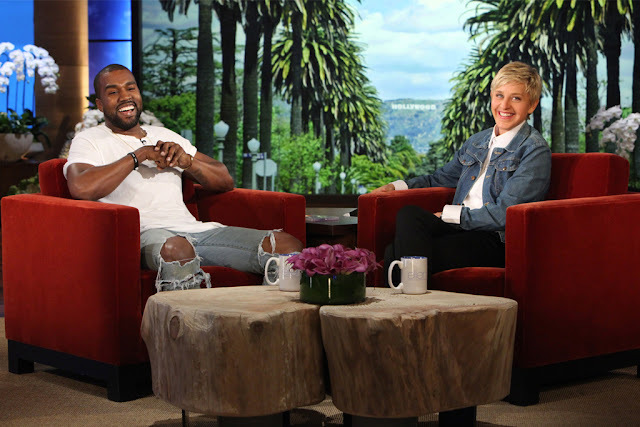 Kanye West sat down with Ellen Degeneres for an in-depth interview last night and it wasn’t a regular interview. The rapper discussed the possibility of having more children with Kim Kardashian, having no regrets about his tweets, the lack of diversity at the Oscars, why he should have appealed to Mark Zuckerberg for 1 billion dollars on Facebook and how he would help the world if he had more resources. His answers quickly transformed to a nearly 8 minute monologue / rant about wanting to remove bullying from our existence, and how we are “one race, the human race.” He touches upon on having the condition of “synesthesia”, spending time with President Obama, wanting to be “Michael Jackson of apparel” and much more. On the lighter part, he also played the “5 Second Rule” game with Ellen. Watch the clips below.